On Monday, May 5th, and Tuesday, May 6th, the Lincoln Stars will participate in USHL's Futures and Entry drafts. The Futures draft (Phase 1) will be held on Monday, May 5th starting at 5pm CST. The Entry draft (Phase 2) will be held on Tuesday, May 6th starting at 8am CST. I'll talk about the differences between the two drafts below for those who may be a little confused. Before I get started, click here to read a very informative article about the draft process from the USHL website. Futures Draft (Phase 1): This particular draft consists of eight rounds, as each USHL team will select eight players (and sometimes less, depending on prior trades or if they've signed any tenders) from the 1998 birth year age group. Only players born in 1998 can be selected in this particular draft. USHL teams utilize this draft to select some of the best young players in North America or Europe in hopes that they will develop into full-time players over time. Some players on the Stars' roster last season that were selected in prior futures drafts were Zach Frye, Max Humitz, and Keegan Ward. Very rarely do players selected in the Futures draft play for the team that selected them that same season. Keegan Ward was the last to do it for Lincoln. Before that, it was Daniel Willett. The two-part draft starts with Phase 1 taking place on Monday, May 5th beginning at 5:00 PM (CDT). For the third consecutive year, picks in Phase 1 will be announced on a live broadcast at www.USHL.com. The USHL Draft Show is being provided for free via FASTHockey, the USHL’s exclusive digital video network. Phase 1 consists of eight (8) rounds as USHL teams will select players from the 1998 birth year. This single-age portion of the USHL Draft allows teams to choose players who are traditionally not ready to play in the USHL the following season, but will continue to develop at lower levels of hockey in preparation for USHL play in future seasons. While not yet USHL full-timers, a number of those players will see game action in the coming season. Click here to view the players selected by the Stars in the 2013 USHL Futures Draft. Click here to view the players selected by the Stars in the 2012 Futures Draft. Click here to see the players selected by the Stars in the 2011 Futures Draft. Click here to see the players picked by the Stars in the 2010 Futures Draft. 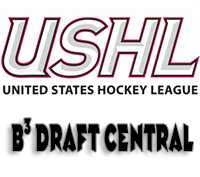 Phase 2 of the 2014 USHL Draft is scheduled for Tuesday, May 6th beginning at 8:00 AM (CDT). All selections will be posted in real-time at USHL.com. In this phase, USHL teams will select players from multiple birth years as they look to fill their protected lists with players who will compete for roster spots for the 2014-15 season. Phase 2 continues until all USHL teams have secured 45 players on their Initial Protected List. That list includes affiliate players from the 2013-14 season, players selected in Phase 1, and players signed to a tender. Click here to see the players selected by the Stars in the 2013 Entry Draft. Click here to see the players selected by the Stars in the 2012 Entry Draft. Click here to view the players selected by the Lincoln Stars in the 2011 Entry Draft. Click here to view the players selected by the Lincoln Stars in the 2010 Entry Draft. There's a lot of uncertainty right now in terms of who will be wearing a Lincoln Stars jersey to start the 2014-15 season. New GM Jon Hull has the task of picking the players in these two drafts based on his scouting knowledge, as well as the advice he is getting from assistant coach Mick Berge and the Stars' scouts throughout North America and Europe. Although he has not hired a head coach as of yet (or he has and it has not yet been announced), I'm sure Hull has a very good idea on the type of player(s) he wants to draft and play next season. I've had a numbers Stars fans ask me this, but I don't think it's a bad thing to not have a head coach hired before these two drafts. There is still plenty of time in the next few weeks to make that decision and have that person in place when the tryout camp in Minneapolis rolls around in June. So it will be interesting to see the type of players that are selected by the Stars in these two drafts next week. The Stars will have an opportunity to draft early in the first round of both drafts, surprisingly. I guess as a Stars fan I've gotten used to not having first round picks due to prior trades. However this year, Lincoln will draft 4th overall in the Futures draft and 5th overall in the Entry draft (unless those picks are traded here in the next few days before the drafts). Those top players picked in the entry draft in particular will be counted on to contribute right away next season. Because the Stars do not have a goaltender on their affiliate list, and with only Jacob Nehama potentially returning from last year's team, I would expect that the Stars will draft at least one goaltender in the Entry Draft. I'll be following both drafts live as they occur, and will post the selections made by the Stars in two separate articles (one for the Futures Draft, one for the Entry Draft) here on the blog. I will also be very active on Twitter during those two drafts, so make sure you follow along. I will tweet every draft selection made by the Stars, as well as statistical information about each player drafted. If you're not already on Twitter, give it a shot. You won't regret it. As I mentioned above, the Futures Draft on Monday, May 5th will be broadcast live via FASTHockey.com, so tune in at 5pm CST for that. Thanks for the comment, Wally. Great question. Yes, everything I've heard indicates that the Indiana Ice will go dark after this season. There will be a dispersal draft for all Indiana players (both on the active roster and affiliate roster) that will be held after the two drafts next week. I wouldn't expect this dispersal draft to occur until Indiana's season is over. I've heard that the two new expansion teams (Madison Capitols, Bloomington Thunder) will not participate in the dispersal draft. But every other USHL team will.